This top features a faux contrast zipper on the side, two side pockets with stylish colour contrast tape and side slits that also feature contrast tape. 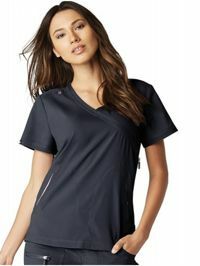 The material used for this top is moisture wicking, stretchy, easy wash and wear and wrinkle free. The top has on the side for extra comfort and a bungee loop for your ID badge on the shoulder. Top made from 100% polyester dobby stretch.